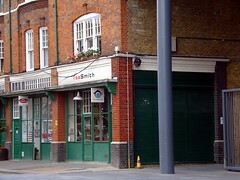 Tea Smith was a tea shop just to the north side of Spitalfields Market. It has now closed. As of June 2017 the premises are occupied by a newsagent and off licence photo. A tea shop for tea geeks, just to the north side of Spitalfields Market. While much of the shop space is taken up by displays of packaged tea and tea paraphernalia, there's also a decently-sized tea bar/counter, with eight bar stools. While the bar stools aren't too uncomfortable, they would be a little tricky for the mobility-impaired, and there was no alternative seating in evidence. At the tea bar, most teas are priced at £3.50 or £5 per pot, with rarer teas (e.g. gyokuro) at £7. (Kake tried the Snow Jewel, at £5.) Each tea is brewed in its own particular pot; water temperature is controlled by thermometer and brewing time by timer. You're given three infusions per pot, and the staff member on duty behind the bar will keep track of when to start and stop brewing, and will pour your tea into a small jug for you when it's ready for serving. Little sweet snacks are available to accompany your tea; walnut and miso biscuits, matcha financier, and fruit financier are all £1.50, while yuzu chocolate cake is £3.50. They also have chilled teas for the hot weather. The ambience is nice and peaceful, and conducive to lingering. Background music is unobtrusive without being boring. Kake's verdict: I will come back; this is perhaps my favourite London tea shop so far. Though I'm not keen on the stools. Billy's verdict: I've not sat in for tea yet, but the staff are very friendly and knowledgeable as well as happy to chat about the universe. Their tea also seems to be generally pretty tasty. The girl behind the bar on my last visit was very apologetic about not having any sensible tea strainers (although their range of big flower shaped ceramic ones was fearsome) and happily chatted away with me while my tea buddy poked at the packets. Last visited by Billy, December 2008. Opening hours verified with staff by Kake in June 2008. Last edited 2017-06-16 14:56:58 (version 9; diff). List all versions. Page last edited 2017-06-16 14:56:58 (version 9).